You’ve decided to take the plunge and buy a sewing machine. Before you grab your credit card and hit the ‘Buy It Now’ button, you need to do a little research and a bit of self-examination. With hundreds of stitches and tons of decorative features, it’s easy to get overwhelmed by all the options. Stop for a moment and think about how you realistically will use a sewing machine. Don’t want to read the whole review? Here’s the quick summary. Choosing a sewing machine as a beginner can be really difficult. Don’t get bogged down in the details, here’s a quick look at our top picks. Check out our full review below. What is a Heavy Duty Sewing Machine, and do I Really Need One? What are the Best Sewing Machine Brands? While there’s something undeniably impressive about a sewing machine that does a hundred different stitches and offers every possible feature, not everyone is looking for all the bells and whistles. If you’re new to sewing or just like to keep things simple, one of the following no-frills machines will get the job done. Today we are going to look at five great, no-frills machines that are perfect for learning on or tacking basic projects. Even though this is a computerized sewing machine, it’s included in the list of favorite sewing machines for beginners. It has many features of a more costly machine, and you won’t outgrow it quickly. It’s one you’ll always keep as an auxiliary or back-up sewing machine. The Singer 7258 has a metal frame for durability and has 100 built-in stitches. 90 percent of the time, you’ll only use a couple of the stitches, but it’s fun to have all the decorative stitches to play with. It has all the basics features like bobbin winding, free arm sewing, automatic buttonholes and automatic needle threader. However, it has features that you normally don’t find in a machine at this price point. You can use the foot pedal to sew, or you can stitch automatically, using a speed control slider. This is great if you want to do free-motion quilting or want to control the maximum speed your machine will stitch. The machine also can tie off stitches and has two thread cutters. It comes with 10 presser feet and all the accessories you’ll need. It also comes with a training DVD, so you’re not all alone in the world with your scary new computerized sewing machine. The Brother CS6000i is a computerized sewing machine that is economically priced for the beginner. It has 60 stitches for decorative and utility work, and the package includes nine presser feet for all types of stitching. Automatic needle threading and programmable up/down needle position are nice features you’ll appreciate. Click here to read our full review of the Brother CS6000i! All the stitches are displayed on the side of the machine and are selected using an LCD screen and up/down buttons. The LCD screen also alerts you if you’re using the wrong presser foot, so you won’t mess up. The machine also has an automatic start/stop button for sewing without the included foot control. There is a variable speed control, so you can stitch at the speed that’s most comfortable for you. This package also comes with a hard case and, best of all, an oversize table for working on larger projects like quilts. This little machine is perfect for everyday sewing. It has 12 built-in stitches that include stretch stitches and zigzags. The selection knobs are clearly marked, so you don’t need to dig out the manual to set a different stitch, width or length. It comes with a buttonhole foot, a zipper foot and a blind foot, so you don’t need to buy any other feet to use all the stitches. Check out our full Janome 2212 review here. The Janome 2212 also has a manual tension knob on the front of the machine, so you can easily change the needle thread tension. Those are the only dials you need to use, and they’re so clearly marked you won’t have any problem adjusting the machine. Threading the machine is quite simple and straightforward. It has a front loading bobbin, which is the one downside to this machine. It takes a little time to get used to front-loading the bobbin, but once you’ve done it a few times, it’s no problem. Removing a section of the sewing bed converts it to a free-arm machine. This is great for sewing cuffs, children’s clothing and doll clothes. You can also lower the feed dogs to make the machine perfect for free-motion quilting. Lowered feed dogs are also handy if you’re darning holes or want to do appliqué. This little machine is very modestly priced, but gives a big bang for the buck! It’s small, so it’s great in an apartment or dorm room where space is at a premium. That said, large projects like drapery or bed-sized quilts might be a challenge, as the throat is quite small. On the positive side, the sewing bed snaps off, so you have a free-arm for small things like cuffs, pant legs, doll and dog clothes. The Brother XM2701 has 27 built-in utility and decorative stitches and does one-step, automatically sized buttonholes. The package includes five presser feet, so you don’t need to buy any other accessories for different types of sewing stitches. A cool feature is the automatic needle threader. Threading the machine is simple and easy to learn, and it has an automatic bobbin-winding feature. The Brother XM2701 features drop-in bobbin loading, which is the easiest, least problematic design. This machine gives you features that are commonly found on more expensive sewing machines, but not so many features that you’ll become confused or discouraged. If you’d like to read our full Brother XM2701 Review here. What makes the Singer 4423 a good choice for a beginner is its metal frame and heavy-duty motor that stand up to a lot of abuse. It can stitch up to 1,100 stitches per minute, although most beginners won’t use that feature. It’s called a heavy-duty machine, but it really isn’t heavy duty enough for six to eight layers of denim or canvas. However, it’s very good at general sewing and has all the basic features you want in a beginner’s sewing machine. 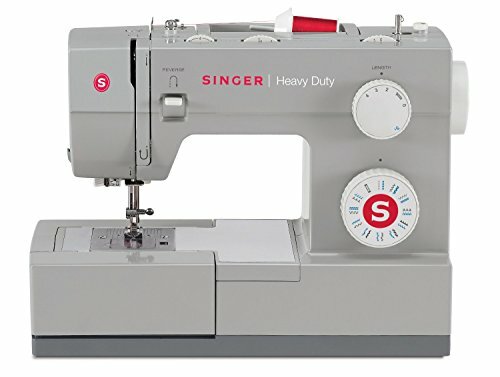 Check out our full review of the Singer 4423 here or check it out in our heavy duty sewing machine round up where it took the #1 prize. The dials are straightforward, and you can easily master tension, stitch length and width. It has a lever to drop the feed dog, a one-step buttonhole feature and a removable bed for free-arm sewing. If you’re a sewing newbie, you probably have a zillion questions about what sewing machine is right for you. Before you run out to your nearest sewing machine retailer, sit down and have a little conversation with yourself. You need to make decisions on a number of things while you’re out shopping. Doing a little pre-planning and understanding the basics about sewing machines before you hit the stores can make the experience far less stressful. You won’t be as confused with all the various styles, brands, models, and you have a better chance of purchasing a sewing machine that’s just right for you, your expectations and your budget. Before you do anything, decide just how much you can afford to spend. Because there is a vast range of price points in sewing machines, you’ll quickly become bogged down with too much information. Machines can range from less than $100 to several thousand dollars. If you plan on using the machine with increasing frequency as your skill develops, buy the best machine you can afford in the category you’ve chosen. However, if you don’t think you’ll ever use the machine for anything more than occasional mending, don’t buy something with more features than are necessary. If you’re planning on using your machine for only shortening hems and repairing seams, you don’t need to invest in a high-end machine. If you’re interested in learning how to make your own clothes or do home decorating, you need a machine that has the ability to grow with you. If you’ve decided you want to learn a hobby and do specialized projects like machine embroidery, free motion quilting or tailoring, you’ll be interested in a higher end machine with multiple features. The three basic types of sewing machines include mechanical, electronic and computerized models. Each has virtues and drawbacks, and your choice depends on how you’ll use the machine and how much time you want to devote to mastering the features a machine has. A mechanical sewing machine is generally in the lowest price group. It’s easy to learn to use and isn’t complicated. It has basic amenities that are often enough for a beginning sewer. All sewing changes are made with dials or levers. Tension, stitch choice, stitch length and width are selected manually. A mechanical machine is pretty uncomplicated. It does straight stitching, and almost all machines will do zigzag stitching. Gears, cogs, wheels and a motor are all that is encased inside. It doesn’t do a great number of stitches, but you won’t be dragging it to a repair center all the time either. Remember, just a few decades ago, all home sewing was done on this type of machine, and the quality of work produced was impressive. With fewer features and components, they generally require less maintenance and don’t often need costly repairs. Electronic machines have more bells and whistles. They generally have scores of stitch styles built in and advanced features. This may include a built-in alphabet, tension control, automatic threading, touch-screen controls and other conveniences. Since these machines use electronic boards to control the features, they are more complex to learn and can require expensive repairs. Mechanical and electronic sewing machines are relatively simple when compared to a computerized machine. These expensive machines probably come with a thick user’s manual and perhaps a DVD tutorial. However, computerized machines have loads of automated features like on-screen help, empty bobbin reminder or advice to change the presser foot for a selected stitch. The stitches a computerized machine can create are amazing and versatile. The decorative stitches are great, but there are stretch stitches, overcast stitches and even stitches that simulate a serger. With a manual sewing machine, you’ll have to adjust your machine with knobs and levers as you work. Computerized sewing machines will let you control everything with the touch of a button. With hundreds of stitches from which to choose, pre-programmed patterns, alphabets and the ability to import designs from a memory card or computer, a computerized sewing machine is a perfect machine for someone who’s an advanced sewer or plans on enthusiastically pursuing this hobby. When you’ve narrowed down your choices, it’s time to try out the machines you’re seriously considering. Don’t just watch a salesperson sew on the machine. Sit down and try it out yourself. Try different kinds of fabrics, stitches, speeds and tensions. Is the machine noisy or awkward? Can you control the speed easily? Does it have a free arm for sewing small circumference items like sleeves or children’s clothing? Make a buttonhole, use the zipper foot and inquire how many presser feet come with the package. If you’ll need to put it away after each use, does it come with a case? If you plan to use it on-the-go, is the machine lightweight enough to carry easily? Where is the machine serviced and what is the typical turn-around time for repair? What is the recommended care and service routine for this machine? Does this retailer have a trade-up policy if you want a better machine in the future? What kind of financing is available and is it comparable to what you can find elsewhere? Does the retailer offer classes? Are they free, how many are included and may they be repeated? Any sewing machine can be a quilting machine. You just need to be able to retract the feed dogs and attach a darning presser foot to do free-motion quilting, or use a walking foot for machines that don’t have retractable feed dogs. A walking foot and raised feed dogs will limit free motion, but they work well for straight-line quilting. Sewing machines touted as quilting machines usually have a large throat, so you can stitch big, bulky pieces. They usually have an extra-large sewing bed to support more of the quilt’s surface. Many popular sewing machines are designed with multiple uses in mind, but some are especially designed with quilting in mind. They’re often a little more expensive than regular machines, and many can’t handle thick, dense projects like leather or multi-layer upholstery. Taking it one step further, an embroidery machine doesn’t just make pretty stitches; it can create intricate, multicolored designs, complex patterns and lettering. Most machines come with some pre-programmed patterns, and designs can be uploaded into the machine. Software in the machine allows for some editing and manipulation, and there are a many computer embroidery design programs to create your own embroidery patterns. Another bonus that comes with their higher price tag is that embroidery machines can take fancy patterns from the internet and automatically embroider letters, designs, and more onto your projects. Some are designed to do nothing but embroidery, but most have a few standard sewing options, too. Scared that you’ll be in over your head with an embroidery machine? Not to worry, we’ve got a fantastic beginner’s guide to embroidery machines that might help demystify these complicated looking contraptions. Heavy duty sewing machines may have fewer fancy features, but they can power through anything from leather to stacks of paper. When it comes to your first machine, there is no right or wrong answer. As long as you pick the machine with the features you think you’ll use the most, you’ll be thrilled with your choice. Bobbin Winder – Automatic winding mechanism to transfer thread onto a bobbin. Balance Wheel – Attached to the motor, this wheel can be used to manually raise or lower the needle. Stitch Width Regulator – Adjusts the width of the stitch for zigzag and other decorative stitches. Stitch Length Regulator – Adjusts the length of the stitch from long for basting or short for working with fine fabrics or decorative stitches. Reverse Lever – Reverses the direction of the stitching. Foot Pedal – Operates and controls the speed of at which the machine stitches. Bobbin – The small spool that holds the lower thread. Bobbin Case – The case into which the bobbin is placed for sewing. Feed Dogs – Rows of teeth that shift backward to move the fabric as the needle stitches. May be lowered on many machines, so the operator controls the movement of the fabric. Presser Foot – Removable foot that holds fabric in place while the needle stitches. Many styles are available for different sewing tasks. Presser Lift – Raises and lowers the presser foot. Stitch Selection Panel – A manual dial or computerized pad from which pre-set stitches are selected. Thread Guide – The thread goes through a series of guides that take it from the spool to the needle. If the machine is not threaded correctly, it won’t stitch properly. Thread Take-up – A thread guide that moves up and down to feed the thread from the spool. Spool Pin – Positioned either vertically or horizontally, the pin holds the spool of thread in place. There is no one answer to this question, and even after you scour the internet for answers, you’ll still probably be confused. Sales people are biased, as they want to sell the brands they carry. Checking out sewing forums and reading customer reviews is anecdotal at best. For every scathing review of a terrible machine that failed miserably in every way, you’ll probably find just as many extolling its many virtues. Read reviews and get an idea of the percentages of good versus bad reviews. A machine with a large percentage of positive reviews is probably going to be a better machine than one that gets mainly bad reviews. Buy a machine you can have worked on locally, if necessary. This is important if you have a problem or just need a general servicing. Buying a name brand machine from a reputable seller is also a good idea. If you decide to return it, you’ll have fewer headaches. We’ll assume you’ve purchased your machine and figured out how to use it. It’s sort of like learning to drive. Once you feel comfortable with driving down the road and backing up, you need to learn how to use the windshield wipers, the turn indicator and how to open the hood. Here are some tips to make your sewing projects a little easier and more successful. One needle size is not right for every sewing project. If you’re working on heavy fabric like denim, canvas, vinyl or leather, you absolutely need a heavy-duty needle that has a sharp point. For general sewing, a universal needle is fine, but when you start using very fine, stretchy or heavy fabrics, your stitching will be better if you use a needle specific for that type of fabric. Keep your needle in the down position to hold the fabric in place when you pivot to turn a corner. If you’re having a problem with tension – too loose or too tight – rethread both the bobbin and upper needle thread. You may have threaded the machine wrong, or the thread may have jumped a guide. If you have a computerized machine, turn it off and turn it back on again. Just like a computer, sometimes your machine has a ‘snit’ and just needs restarting along with the re-threading. Keep the machine clean. Remove the needle plate and bobbin case. Use a vacuum or canned air to remove lint and thread. Use a Q-tip dipped in rubbing alcohol to clean any lint build up that isn’t removed by vacuuming on the bobbin case or area within view under the needle plate. This is especially important if you’re sewing with burlap, flannel and other fabrics that shed a lot of fiber. Iron everything. You’ll wind up with a much neater and more professional looking item if you iron between every step. When you buy fabric, check to see if it shrinks. If it does, wash the fabric before cutting out your pattern pieces. Fabric often is treated with a chemical to set the dye, and it’s been handled many times before you buy it. You might want to wash all fabrics you buy before sewing. Clip curved seams so they’ll lie flat. Cut tiny notches out along the length of the curve, being careful not to cut your seam. If the needle plate of your machine doesn’t have sewing guides or if you need one of a different width, measure where the edge is from the needle and place a strip of tape on the sewing bed. Now, you can mark it with a pen and ruler, and you have instant, custom stitching guides. Seam rippers are wonderful if you make mistakes. Keep one handy. A bodkin is a long, thin piece of metal or plastic with a large eye at one end and a ball tip on the other. You can use it to thread ribbon or elastic through a casing and turn tubes of fabric inside out.